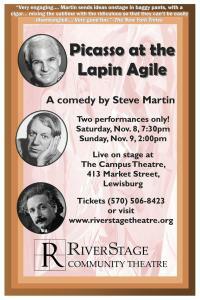 Saturday, November 8, 2014 7:30 p.m.
Sunday, November 9, 2014, 2:00 p.m.
Picasso at the Lapin Agile is a play written in 1993 by comedian, screenwriter and author Steve Martin (of Saturday Night Live fame, writer of movies such as The Jerk, L.A. Story, Roxanne, Shopgirl). This long running Off-Broadway absurdist comedy places Albert Einstein and Pablo Picasso in a bar, The Lapin Agile (Nimble Rabbit) in Montmartre, Paris in 1904, just before the renowned scientist transformed physics with his theory of relativity and the celebrated painter set the art world afire with cubism. In his first comedy for the stage, the popular actor and screenwriter plays fast and loose with fact, fame and fortune as these two geniuses muse on the century’s achievements and prospects as well as other fanciful topics with infectious dizziness. Bystanders, including Picasso’ agent, the bartender, his mistress, Picasso’s date, a philosopher, an inventor, and a countess introduce additional flourishes of humor. The final surprise patron to join the merriment at the Lapin Agile is a charismatic dark haired stranger time warped in from a later era. The play takes place in one non-stop scene, lasting approximately 80 to 90 minutes, with little conflict but a satisfying combination of whimsical nonsense and philosophic conversation. So pull up a stool, order a drink, and watch the comedy unfold! Order Your 2014-15 Subscription Package Now! Bring Your Group (10+) to the Show!